Regina Marti is a self-taught Doll and Teddy Bear artist. She grew up in Switzerland but has moved all over the world with her family. In 2008 Regina created her first cloth doll and hasn’t stopped ever since. Doll making is very rewarding and comforting. One starts with some wool and fabric and all of sudden a little person is looking at you. “This helped me cope with our moves all around the world and raising children far away from our families”, says the artist who recently relocated with her family to Glasgow, Scotland. Regina creates her dolls from soft sheep’s wool, cotton jersey fabric and mohair yarn using different techniques – such as needle felting, soft sculpting, sewing, crocheting and knitting. Over the years her dolls have evolved to complex needle felted cloth dolls with wire armatures, different body constructions for great posing and yet a warm feel. 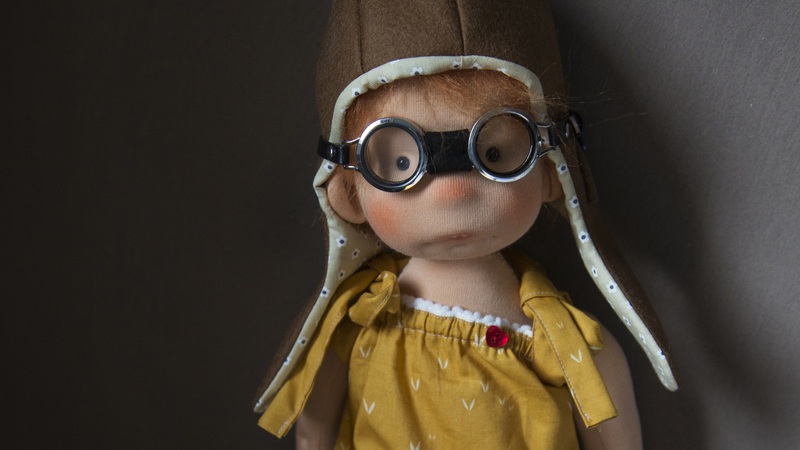 Creating a charming, friendly character with great attention to little details is a key feature in her work and makes this doll and bear making journey so exciting. After the completion of a new fiber art doll, Regina enjoys taking photographs in different settings. This is a crucial process for presentation but also to be able to let go into the world what took the artist countless hours to create in her small studio. Regina Marti presents her work through her blog (www.marticreates.com) and her etsy shop (www.mARTicreatesASmile.etsy.com). Regina is also part of Dollectable – an international collective of natural fiber artists (http://hyenacart.com/stores/dollectable). Please take a moment to visit my whimsical world of charming characters. I’m glad you are here – please come back often. Wonderful work – special,, gentle and tender. Great! Your dolls are so precious, they make me smile. Thank you very much, Jodie! I live in Querétaro Mexico. Love your dolls. How can I order one?